While serving in Pombal as a junior companion, Elder Cutler had some time on his hands while his companion was busy with branch work. 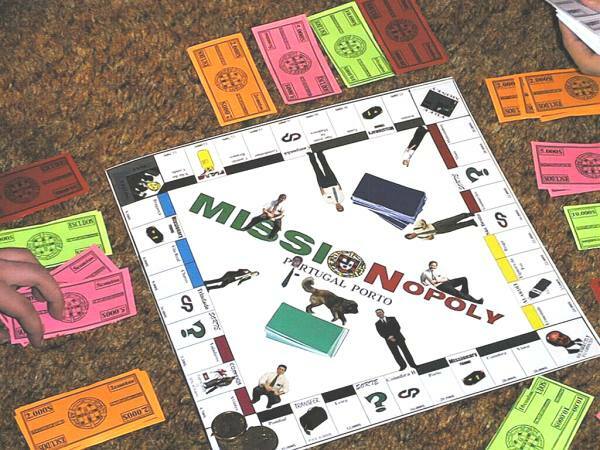 He took advantage of this time to create the graphics needed to create a version of Monopoly, Porto style. Of course, Pombal and Leiria were substituted for two most valuable properties. The other properties were also cities in the mission.The utilities were from Portugal, Portugal Telecom. Pictures of missionaries and even Grizzly decorate the board. He gave President West a version of the game. Later, while serving in the mission office, Elder Cutler enhanced the game and gave it as a gift to President and Sister West the day they left the mission. He conveniently stored the board, cards, and pieces in a Telepizza box.